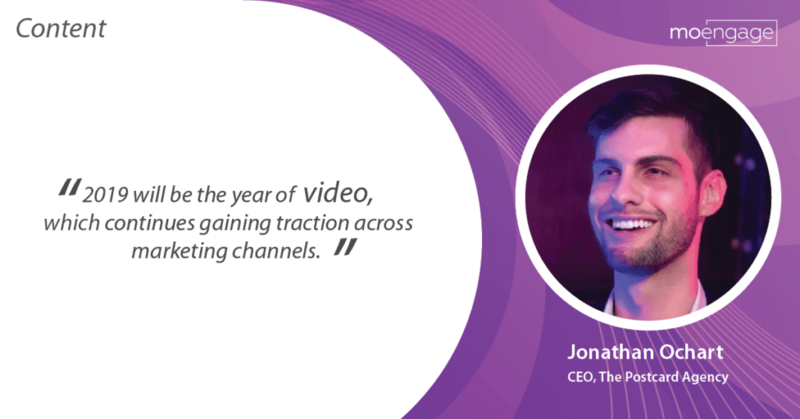 Jonathan Ochart, CEO of The Postcard Agency, was featured in MoEngage’s “Book of Marketing Trends 2019.” In his interview, Ochart discussed video marketing, its growing popularity across marketing channels and ability to help brands build trust among target audiences. The eBook shares insights and predictions from 101 top marketing leaders from companies like Adobe, Fujitsu and SurveyMonkey. Ochart also highlighted the role video marketing can play in helping brands build trust, affinity and loyalty in a time when customer trust remains low. MoEngage’s eBook showcases insights and predictions around other marketing trends, including AI and machine learning, marketing automation, mobile marketing, content marketing, marketing analytics, cross-channel marketing, social media marketing and SEO. The Postcard Agency connects brands with target audiences through dynamic digital, social media, content marketing and video marketing strategies. Crafty and creative, the Miami-based agency reinvigorates brands with imaginative and results-driven campaigns.